I wrote recently about population density and its relationship to voting behaviors. In the 2012 election, high population density correlated with votes for Obama, while low density correlated with votes for Romney. Others observed that red states have more traffic fatalities than blue states. This is fairly easy to explain, as red states are lower density than blue states and people necessarily spend more time in cars than in the cities of blue states. Some suggested that race is more important and proposed some version of “white people vote for white people, black people vote for black people” as the simpler explanation. But this notion has always struck me as simplistic. So I decided to dig in to voting behaviors by examining racial composition and the 2012 election results at the county level. Any significant level of diversity seems to trigger liberal voting behavior. At 9% Hispanic population (or just 3% Asian population), people vote blue. Think about that for a second… if your county has just a 3% Asian population, it most likely voted Democratic. So Do People Vote by Race? The data show that when the percentage of black population exceeds 39%, Obama receives the bulk of the votes. This would indicate that yes, black people do often vote for black people, which by itself is not that informative. But Asians and Hispanics also apparently vote for black people as well. 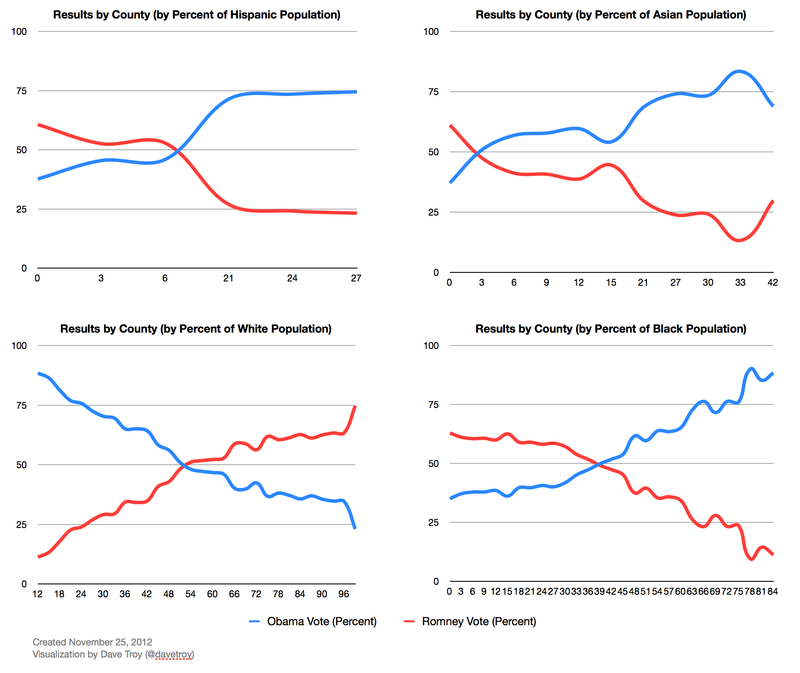 Above about 55% white population, counties overwhelmingly voted for Romney. But up to 45% white population, votes went to Obama. The real drivers seem to be density and diversity. Density (such as found in cities) corresponds with diversity. Diversity leads to progressive voting behavior. It’s simplistic to think that it’s all about identity. White voters didn’t all vote for Romney, black voters didn’t all vote for Obama, and Hispanic and Asian candidates overwhelmingly supported Obama. There is no particular reason to think that an Hispanic Republican candidate can win by running on the same old platform. To succeed, both parties need to run candidates that will appeal to the population in America’s increasingly diverse and dense cities. You may have the causality reversed on this one. For example, the Asian immigrants I know would only move to an already diverse (and liberal) area. I’m not making any statement about causality here. Just noting the correlation. Why does the % Hispanic end at 27%? Are the data grouped? There are certainly Texas border counties with much higher percentages than that. Beautiful charts. Lisa, the data are grouped into percentage ranges of 3% each, so that label should properly be 27-30%. If there are border counties that you’re aware of that are greater than ~30% Hispanic, this could be an error on my part. I will double-check my dataset this afternoon. The source is the 2010 Census data (via American FactFinder). Exactly.. all the university-educated Asians (and/or those with money) I know & talked with will only move to cties/suburbs that are diverse (West coast, East coast & if Dallas, Austin, Houston if they had to goto a Southern state ..and they want to live nearby a Chinatown or similar where they can still shop for Asian foods)..
Really interesting. Any way to look at the relationship from prior elections (i.e., when both candidates were the same race)? Would be interesting to see what the patterns look like and if the break points were the same. Ideology correlates with pop density. I’ve thought this for years. Fascinated to find others thought so too … and you did the work to correlate … CONGRATS! Why is it so? Also a fascinating question. Might I suggest that Alexis de Toqueville was the first to observe this back in the 1830s when he struggled to explain WHY the rural south demonstrated such a radically different social behavior than the industrialized north. Slavery was only the obvious call, but they ALSO differed significantly in population density. My own opinion? Population density influences the way people think about the “collective” vs the “individual”. I think this trumps your theory of diversity, which I bet also correlates to population density.